The brightly hued island of Curacao, 42 miles east of Aruba, is part of the ABC chain of islands, which also includes Aruba and Bonaire. Legend says that an early governor suffered from migraines and mandated the pastel-colored houses, now a trademark of the Southern Caribbean island, because white paint aggravated his condition. Whatever the reason, there's something wonderful about approaching by cruise ship and spotting buildings in shades like cotton-candy pink and deep, ocean-blue. 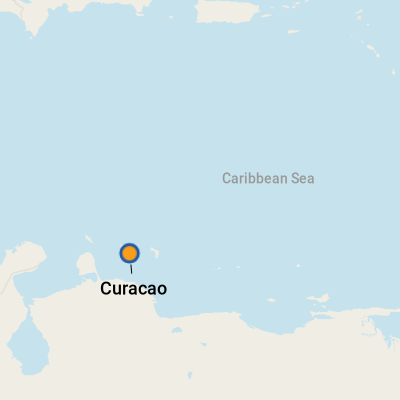 Curacao was discovered by Spaniards in 1499 and was taken over in 1634 by the Dutch, who settled its capital city, Willemstad, as a naval base. The city drew Dutch and Jewish merchants (old Jewish neighborhoods -- like Scharloo, north of Willemstad -- still exist), and there's still a distinctly Dutch feel in the centuries-old buildings that line the waterfront in all those fantastic colors. 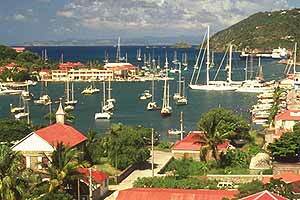 Willemstad, where cruise ships dock, is a vibrant and cosmopolitan city with waterfront shops and cafes. It's walkable and always warm, but never stiflingly hot, thanks to constant, breezy trade winds. The city is split into two districts -- one on each side of a narrow but deep channel, traversable by a landmark floating pedestrian bridge. 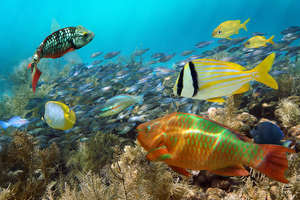 Beyond Willemstad, Curacao is rife with opportunities to dive and swim, with more than 35 uncrowded beaches. 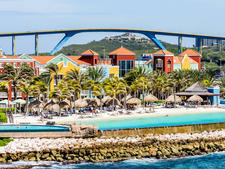 Curacao's port facilities include ATMs, currency exchanges and port guides on site. Taxi stands are also available outside the port. It's an easy walk from the port to Willemstad, a UNESCO World Heritage Site (just like the Great Wall of China and the Taj Mahal) that features sidewalk cafes, funky museums and shops, and neat architectural touches like gables and arches. Though exceptions are often made when cruise ships are in town, shops and restaurants are generally closed on Sundays. On Foot: Visitors to either terminal can take an easy stroll to the Queen Emma Bridge (known as the Swinging Old Lady by locals). This century-old pontoon bridge connects the two sides of the city and is a tourist attraction in its own right. It swings open (sometimes 30 times a day) to make way for ship traffic. If the bridge is open, you can take a free ride from one side to the other on a passenger ferry. Taxis: Passengers should agree on a fare with the driver before the ride. You'll find taxi stands at both port locations. For sightseeing, the rate is about $20 per hour. Buses: If you're traveling on the most common urban routes, you can hop a "collective" car or van. (Make sure it says "Bus" on the license plate.) You can pick up a "Buki di Bus" (bus schedules and routes) on the island. Fares vary but are generally around $2. Renting a Car: Drive on the right-hand side of the road. No special permits are required, but you'll need a valid driver's license and an international credit card. Avis (800-331-1084) has operations at both piers with rates starting about $45 per day. Budget (800-527-7000) offers free pickup at either pier; rates begin at $35. The official currency is the Netherlands Antillean Florin, but nearly all vendors and shops take U.S. dollars. Several banks are located on the bustling street of Handelskade on the Punda side of town. Most have ATM's, and money exchanges are available at the port with currency exchanges. For the latest exchange rates, visit xe.com or oanda.com. At the Sea Aquarium, Mambo Beach Restaurant is a good, casual choice; you can eat on the beach, and the menu is deli fare. If You're In The Neighborhood: In Westpunt, stop in at Jaanchi's Restaurant for Antillean cuisine; try the goat stew or fresh snapper, served Curacao style. If you can't bring back a bottle of Curacao liqueur, look for handmade crafts, such as painted wooden boxes or ceramics. Sample genuine Curacao liqueur (produced in Chobolobo, a 17th-century plantation house). Belly up to the bar, and order drinks like the Blue Lagoon, Zombie, Bleeding Heart and Fuzzy Pirate.